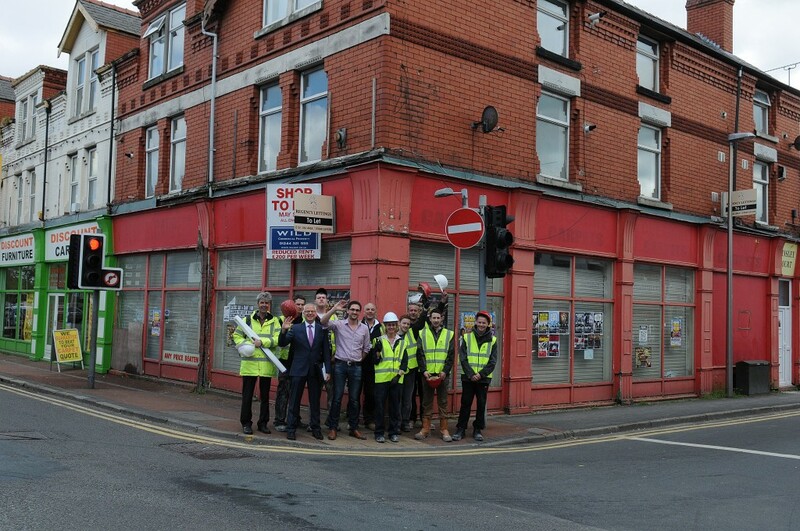 8 May 2014 – Whitby Road is set to welcome another new business, as work begins to bring a disused property back into use. 23-25 Whitby Road was purchased by Rob Stewart in 2013 and its commercial space had stood empty and neglected for many years. Social enterprise ‘Seed’ will take up residence in the property once improvement works are completed and will provide a business incubator service to local entrepreneurs – offering office space and equipment and support to growing businesses. Rob Stewart, Managing Director of Phoenix Rentals Ltd: “We are excited to be part of the wider regeneration programme in Ellesmere Port and provide not only affordable accommodation, but an innovative and creative space for aspiring entrepreneurs to work from. Rob has worked with Cheshire West and Chester Council to bring the property back into use, with affordable flats upstairs and commercial space downstairs. Contractor Access to Training and Employment has been commissioned to refurbish the property – offering training opportunities to local young people by involving them in the renovation works. Gary Williams, Director of Access to Training and Employment, said: “Access to Training and Employment is delighted to be carrying out the conversion of 23-25 Whitby Road into a business hub. Seed has already started making connections with Stanlow Abbey and the Local Enterprise Partnership aiming to fit into the Ellesmere Port business landscape by offering something new, exciting and different on the high street. Seed is also exploring opportunities to work together with the FabLab in Whitby Road, which supports people to materialise creative and new technology led manufacturing ideas and turn these into new businesses. Steve Horbaczewski, Manager of Seed, said: “The business incubator is going to be a new social enterprise called ‘Seed’ and will offer workspace on flexible terms to 25 people in an open plan office environment. The project is part of a programme of town centre improvements, prioritised by the Ellesmere Port Development Board in their Vision and Strategic Regeneration Framework. Looking to target long-term vacant shops in the old high street of Whitby Road, the Council’s grant scheme aimed to bring properties back into use, improve the appearance of the street, help increase footfall for the other shops, and support the regeneration of the wider area. For more information on the Council’s Empty Shop Refurbishment Scheme contact Jochem.hollestelle@cheshirewestandchester.gov.uk. Improvement works begin on 23-25 Whitby Road before business incubator ‘Seed’ takes up residence on the High Street.